Please join us on Easter Sunday at Cornerstone Church. 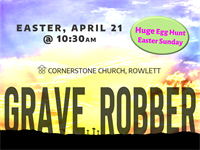 We will have a dynamic sermon and a huge Easter egg hunt for the kids. We can't wait to see you on Easter!